BIG LOVE by Charles Mee at Northwestern University. Scenic Design: Arnel Sancianco. Costume Design: Sully Ratke. Lighting Design: Sara Gosses. Photography by Justin Barbin. BIG LOVE by Charles Mee at Northwestern University. Scenic Design: Arnel Sancianco. Costume Design: Sully Ratke. 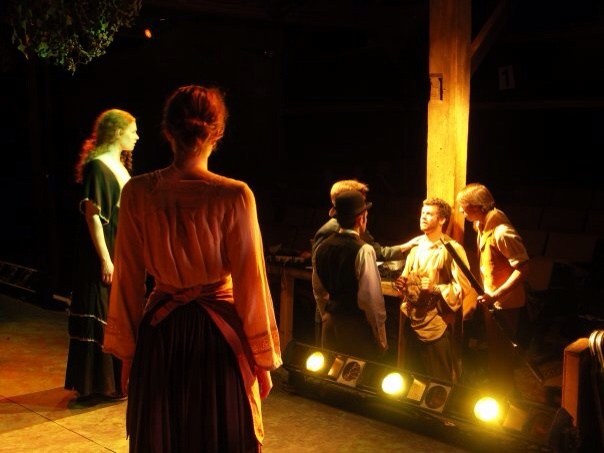 Lighting Design: Sara Gosses. Pictured: Neal Davidson, Matt Dial, Fergus Inder. Photography: Justin Barbin. Hit The Wall by Ike Holter at Northwestern University. Scenic Design by Caitlin McLeod DeSoye, Lighting Design by Alexander Ridgers, Costume Design by Virginia Varland. Hit The Wall by Ike Holter at Northwestern University. From left to right: Zach Nichol, Drew Guerra, Isabella Mehiel. Scenic Design by Caitlin McLeod DeSoye, Lighting Design by Alexander Ridgers, Costume Design by Virginia Varland. Rock cabaret inspired by Dr. Jekyll and Mr. Hyde by Robert Louis Stevenson, Watership Down by Richard Adams, and others. Written/Performed by Alex Benjamin and Gina Marie Hayes. Makeup design by Vega Bond, Lighting by Sara Gosses. Directed and Designed by Gina Marie Hayes, written by Sarah Kane. First Year MFA production at Northwestern University. Promenade-style/experiential. Choreography by Gina Marie Hayes and Jacinda Ratcliffe in collaboration with the cast. Starring Mary Iris Loncto, Isabella Mehiel and Charlie Oh. Photo by Amelia Bell. Ian Fullmer and Erin Johnson in "What Happened in Hamelin" at Red Egg Theater. Written and directed by Gina Marie Hayes, costumes by Amy Bobeda, Lighting by Amelia Rain, set by Chris Frost and Gina Marie Hayes. Photo by Kevin Zamani. Ian Fullmer and Boris Volkov in "What Happened in Hamelin" at Red Egg Theater. Written and directed by Gina Marie Hayes, costumes by Amy Bobeda, Lighting by Amelia Rain, set by Chris Frost and Gina Marie Hayes. Photo by Kevin Zamani. Ian Fullmer as the Pied Piper from Red Egg Theater's 2010 production of 'What Happened in Hamelin.' Photo by Kevin Zamani. Adam Odsess-Rubin in "Charlie: An Adventure" written and directed by Gina Marie Hayes. Based on a short story by Cj Hayes. Costume design by Antonia Gunnarson, Set design by Gina Marie Hayes and Chris Frost, Lighting Design by Will Poulin. Photo by Kevin Zamani. Annie Ritschel and Michael Becker in "Charlie: An Adventure" written and directed by Gina Marie Hayes. Based on a short story by Cj Hayes. Costume and Mask design by Antonia Gunnarson, Set design by Gina Marie Hayes and Chris Frost, Lighting Design by Will Poulin. Photo by Kevin Zamani. Dayna McKiernan, Kristofer Bumanglag, Sutton Arabe, and Caroline Klink in "I Dream of Chang and Eng" by Philip Gotanda, directed by Gina Marie Hayes. Set design by Noah Berkowitz-Mitchell, Costume design by Brooke Jennings, Lighting by Brandon Hawkinson. Photo by Steve DiBartolomeo. Kristofer Bumanglag and Sutton Arabe with the cast of "I Dream of Chang and Eng" by Philip Gotanda, directed by Gina Marie Hayes. Set design by Noah Berkowitz-Mitchell, Costume design by Brooke Jennings, Lighting by Brandon Hawkinson. Photo by Steve DiBartolomeo. Caroline Klink, Kristofer Bumanglag and Sutton Arabe with the cast of "I Dream of Chang and Eng" by Philip Gotanda, directed by Gina Marie Hayes. Set design by Noah Berkowitz-Mitchell, Costume design by Brooke Jennings, Lighting by Brandon Hawkinson. Photo by Steve DiBartolomeo. Alexandra Ho, Kristofer Bumanglag and Sutton Arabe in "I Dream of Chang and Eng" by Philip Gotanda, directed by Gina Marie Hayes. Set design by Noah Berkowitz-Mitchell, Costume design by Brooke Jennings, Lighting by Brandon Hawkinson. Photo by Steve DiBartolomeo. Cecilia Fairchild as Io in "Prometheus," based on Prometheus Bound by Aeschylus, choreographed by Gina Marie Hayes. Random With a Purpose Dance Concert, UCSC. Photo by Steve DiBartolomeo. Erin Johnson in Red Egg Theater's "Book of Tink" by Erik Ehn, directed by Gina Marie Hayes. Costumes by Amy Bobeda, Lighting by Will Poulin, Set by Gina Marie Hayes and Chris Frost. Photo by Kevin Zamani. Adrienne Walters, Katie Burris, Boris Volkov and Travis Wyckoff in Red Egg Theater's "Book of Tink" by Erik Ehn, directed by Gina Marie Hayes. Costumes by Amy Bobeda, Lighting by Will Poulin, Set by Gina Marie Hayes and Chris Frost. Photo by Kevin Zamani. Christine Sage and Justin Tandy in Red Egg Theater's "A Country Doctor," a site-specific performance adapted from the short story by Kafka and directed by Gina Marie Hayes. The cast of Red Egg Theater's "A Country Doctor," a site-specific performance adapted from the short story by Kafka and directed by Gina Marie Hayes. James Pierce in Red Egg Theater's "A Country Doctor," a site-specific performance adapted from the short story by Kafka and directed by Gina Marie Hayes. Set Design by Kacey Kvamme, Lighting Design by Seamus Strahan-Mauk. Photo by Kevin Zamani. Shadow puppet designed by Jaco Connolly from "Three Plays in Moonlight," written and directed by Gina Hayes. A benefit for the Santa Cruz County Actor's Theater, November 2008. Ian Fullmer as Baudelaire in Red Egg Theater's production of Goldfish in Alaska. Photo by Kevin Zamani. Guy Zachary Gardner as Hamlet and Chessa Piker-Ward as Ophelia in Red Egg Theater's Goldfish in Alaska. James Sweet as the Shaman and Sarah Kate Anderson as the Medicine Woman in The Lonely Orchard. Directed by Gina Marie Hayes. The cast of the Lonely Orchard by Nick Herbert, directed by Gina Marie Hayes. Graduate Seminar final project, based on Prometheus Bound by Aeschylus. Lighting design by Danae Havice-Hull. (Pictured: Tanya Finkelstein) Second Stage, UCSC. Cecilia Fairchild as Io in "Prometheus," based on Prometheus Bound by Aeschylus, choreographed by Gina Marie Hayes. Random With a Purpose Dance Concert, UCSC. Ian Fullmer as The Piper in Red Egg Theater's 2010 production of 'What Happened in Hamelin.' Photo by Kevin Zamani. 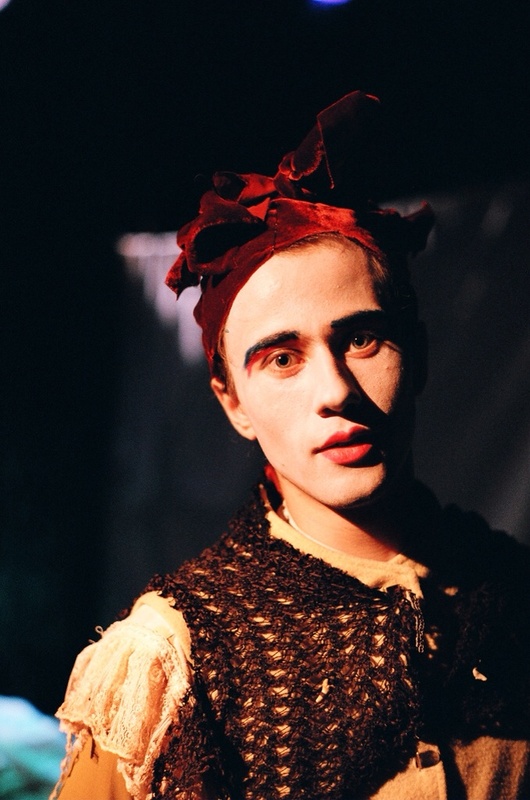 Boris Volkov in Red Egg Theater's 2010 production of 'What Happened in Hamelin.' Photo by Kevin Zamani. Boris Volkov and Ian Fullmer Red Egg Theater's 2010 production of 'What Happened in Hamelin.' Photo by Kevin Zamani. Katie Burris and Boris Volkov in Red Egg Theater's "Book of Tink" by Erik Ehn, directed by Gina Marie Hayes. Costumes by Amy Bobeda, Lighting by Will Poulin, Set by Gina Marie Hayes and Chris Frost. Photo by Kevin Zamani. Puppet design by Kacey Kvamme, for Red Egg Theater's production of "Camelot" by Alan Jay Lerner and Frederick Loewe, directed by Gina Marie Hayes. Photo by Kevin Zamani. Adrienne Walters as Tink in Red Egg Theater's "Book of Tink" by Erik Ehn, directed by Gina Marie Hayes. 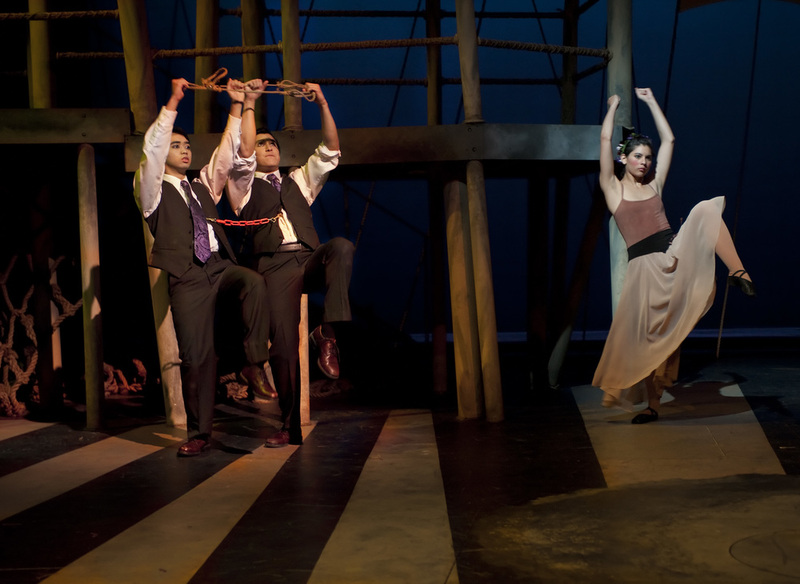 Costumes by Amy Bobeda, Lighting by Will Poulin, Set by Gina Marie Hayes and Chris Frost. Photo by Kevin Zamani. Jake Pino as John and Michael in Red Egg Theater's "Book of Tink" by Erik Ehn, directed by Gina Marie Hayes. 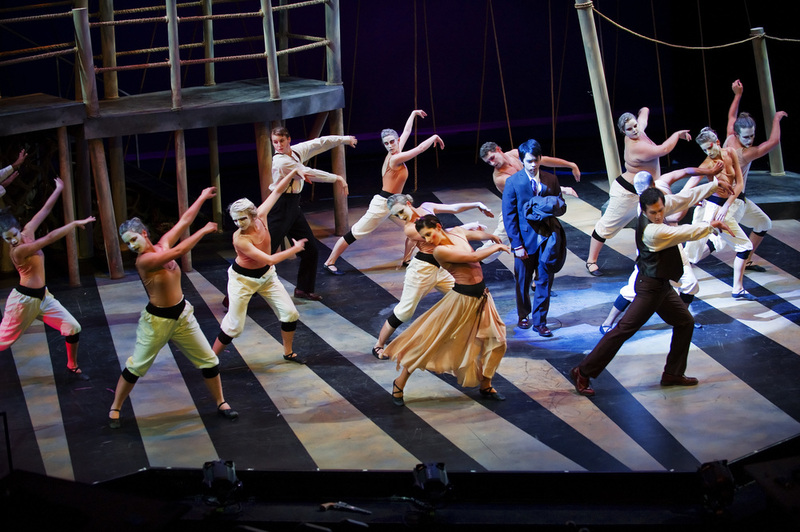 Costumes by Amy Bobeda, Lighting by Will Poulin, Set by Gina Marie Hayes and Chris Frost. Photo by Kevin Zamani. Jonathan Ayala, Annie Ritschel and Kelvyn Mitchell in "Charlie: An Adventure" written and directed by Gina Marie Hayes. Based on a short story by Cj Hayes. Costume and Mask design by Antonia Gunnarson, Set design by Gina Marie Hayes and Chris Frost, Lighting Design by Will Poulin. Photo by Kevin Zamani. Kristofer Bumanglag, Sutton Arabe, and Justin Tandy with the cast of "I Dream of Chang and Eng" by Philip Gotanda, directed by Gina Marie Hayes. Set design by Noah Berkowitz-Mitchell, Costume design by Brooke Jennings, Lighting by Brandon Hawkinson. Photo by Steve DiBartolomeo. Kristofer Bumanglag, Sutton Arabe, and Alexandra Ho in "I Dream of Chang and Eng" by Philip Gotanda, directed by Gina Marie Hayes. Set design by Noah Berkowitz-Mitchell, Costume design by Brooke Jennings, Lighting by Brandon Hawkinson. Photo by Steve DiBartolomeo. The cast of "I Dream of Chang and Eng" by Philip Gotanda, directed by Gina Marie Hayes. Set design by Noah Berkowitz-Mitchell, Costume design by Brooke Jennings, Lighting by Brandon Hawkinson. Photo by Steve DiBartolomeo.